Bradley’s Art & Frame has been custom framing and caring for Houston’s art, memorabilia, and more since 1970. Our team of designers and Master Certified Picture Framers are ready to offer you the personal and professional service you deserve. We provide comprehensive art services, including custom picture framing, art restoration, frame repair, consultations, art installation, pick up and delivery. Bradley’s unconditionally guarantees our quality and your satisfaction. 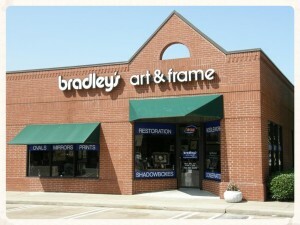 Bradley’s Art & Frame — Family Owned and Operated since 1970. Please visit You Framed A What? to see photos of Bradley’s framing projects. Bradley’s Art & Frame unconditionally guarantees your satisfaction and our quality. Please enjoy our website, and don’t hesitate to contact us at 713-461-5695. Want to see what your framing will look like … before we do the framing? Let us show you on Picture-it-First, our in-house system that allows us to digitally show our valued customers what a finished piece would look like.